In which we talk about Italian helper LazyIT on Google Plus, Wallpaper Competitions, Shutdown Dialogues, Schooling, Window Decorations and new members! So for the entire month of May we will hold a competition for wallpapers. The winners will be chosen by me, Sogatori and another member of the VDG and then the entire community. The level quality of wallpaper needed is high - so the choices will be made first by the three person team as something that is good enough for distro release and then from those passing the initial bar. We will post all things in a devianart group called aptly "VisualDesignGroup" if you have a Deviantart account - ask to join the group, if not post your suggestion in the Forum thread and I or someone else will post it for you. Please remember that your submission must be under CC-BY-SA 3.0, GPL v2 or GPL 3 licence. The theme "The Bright Future" we're going for is "The bright future" and the three chosen winners will all get as a first prize the book "Design Elements: a graphics style manual" as well as the honor and whatever strange nicknacks is found in the back of my cupboard. This is the kicker though - if nothing passes the bar of "good enough to work as a wallpaper" - no one wins. So bring out your best work, your best smiles and lets get this done! There is the question of the shutdown dialogue to sort through too! We're planning on revamping the ever-present "Moon" and need some new ideas. A thread will open up shortly in the forums about this so start thinking already about your suggestions. You don't have to be able to draw it, but a suggestion would be awesome. As I, Jens, is a massive dunce of the quality that spent his youth drawing instead of learning any real valuable skills I simply lack any form of schooling except how-to-make-certain-the-teacher-doesn't-catch-me-drawing-in-the-maths-book-again. So me and VDG member Uri will be schooled in the finer arts of QML by VDG unicorn Andrew Lake and new VDG member Garthecho and we invite EVERYONE to join in! Ok so Andrew and new guy Gartheco has teamed up to get cracking with the new window decorations which you can see below. It has a clearer window bar as that was asked for, a blue stripe along it that disappear as the window is maximized. You can also play with the QML version if you have Project Neon up and running (In Kubuntu for example) in which case you can get it here! There is an insane amount of work going on in the background too so stay tuned for next weeks "Monday" report! Font: Are you using Oxygen? Comme? What font will you use as the official one? Breeze. Hope we'll all get it soon. Yeah, I know a lot of people that will feel relief now that the blue shadows are gone. Wow, that window decoration looks really neat! Though I have no idea what the » buttons are supposed to do. Breeze looks nice. I would just remove the thin blue frame below the title bar. Too much grey yet. 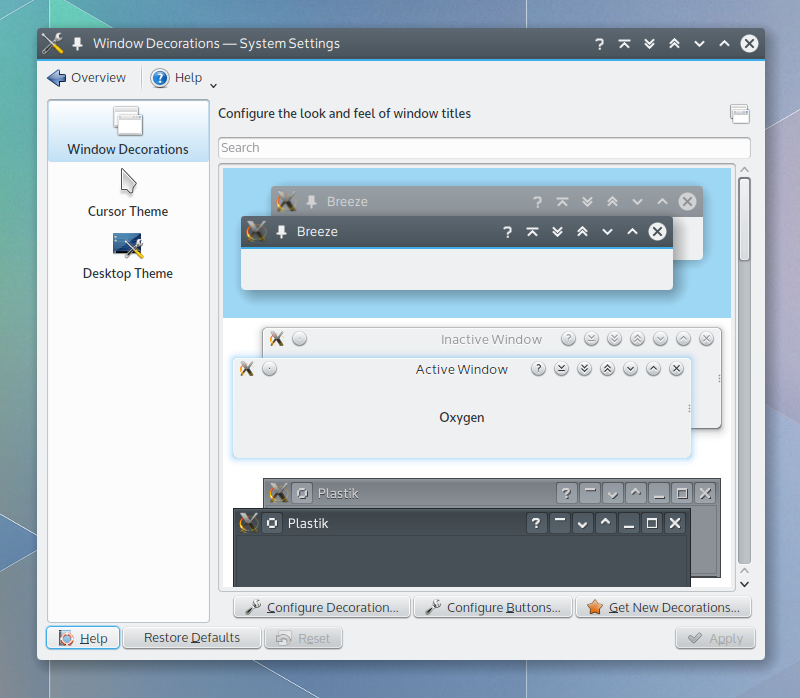 That grey is what kills KDE and makes you want to gouge your eyes out when you see it.